The pagoda is located in the southern part of present day Xi'an, Shaanxi Province, in what used to be Chang'an City in the Tang Dynasty. 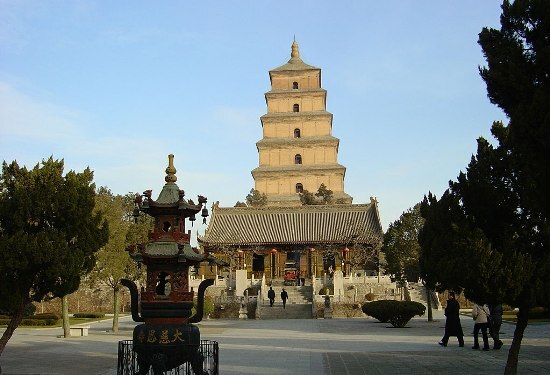 The formal name of the pagoda is Ci'en Temple Pagoda, but since the temple disappeared long ago, the pagoda is known by its other name. Big Wild Goose Pagoda (大雁塔) was first built in 652 in the Tang Dynasty by Xuanzang, a prominent Buddhist scholar in Tang Dynasty. The pagoda collapsed not long after it was built. It was rebuilt between 701 and 704 on the order of Empress Wu Ze Tian. The pagoda tapers sharply from the first storey up, giving the entire structure the shape of a pyramid and making it stand very firm. Wooden steps and flooring inside allow people to go to the top and enjoy the splendid views of Xi'an. In the past, those who had passed the imperial examinations to become officials went there to inscribe their names on the pagoda. - Hours: 8 a.m. – 5 p.m.